I have always used 2k auto clear coat for finishing my electric guitars, with great results. I used to work as a paint sprayer in car body shops (a long time ago now) so it was a natural thing for me to continue using. I normally use a primer, flatten it by sanding, apply a colour coat (either base coat or solid) and finish with a clear coat. After drying and curing, I flatten it with several grades of wet and dry sandpaper, finishing with something like P5000 grade before polishing with Farecla polishing compound with a hand held buffing machine. It’s all the same processes I used as an auto paint sprayer. 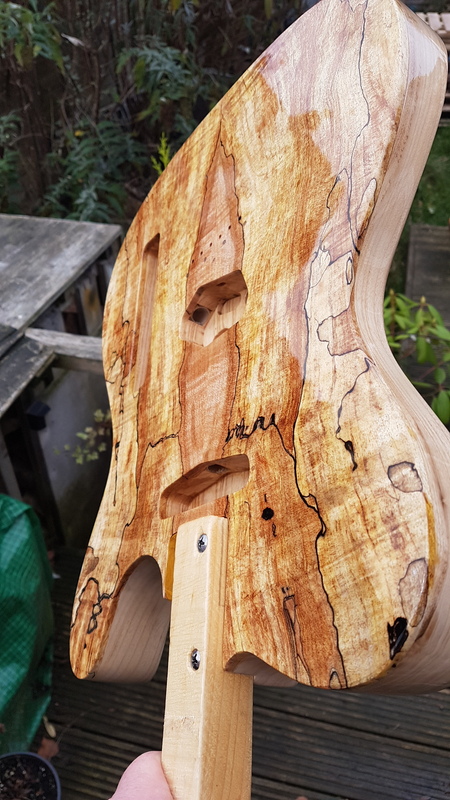 My question is, I have used some beautiful woods on my recent Tele build so I want to leave them visible. Instead of using primer, I used clear sanding sealer. Is this the correct product to use if I’m using 2k auto clear? Will there be any reaction between the two products? Its generally not a good idea to mix different types of finish - but if you do a test and it works then why not? I personally do not have a lot of experience with 2k (two pack) but for non porous wood like Maple I believe you could go straight onto the surface. For ASH or Mahogany you would definitely need to fill the grain first - using any grain filler made for wood. 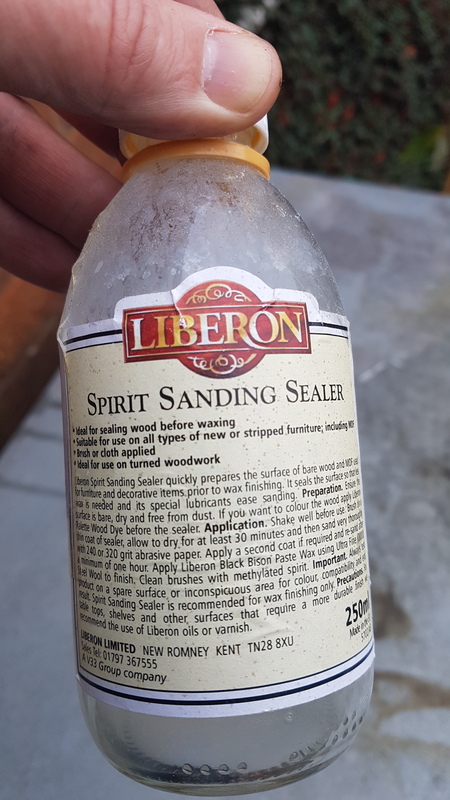 What Sanding Sealer did you use? 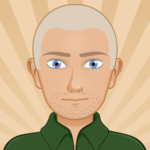 I used Liberon. I was under the impression that I would have to seal everything in sanding sealer before putting any kind of top coat on. Maybe that is incorrect. Are the processes involved any different to spraying a car? Do you always use nitro then? 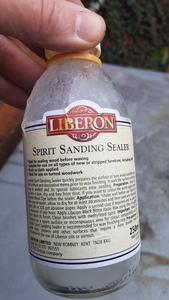 I've never used Liberon Sanding Sealer - I suggest you do a test before risking the guitar - It will probably be OK as long as it is well dry. Hi John, I started using pre-catalized rattle cans by Spraymax and I have had some pretty good results with it! Still learning and practising however! As far as sealers go: the sprit based one you are using should be ok with 2k automotive paint. It gasses of pretty fast and will be cured quickly. But, as Mark says, test it! Thanks for the advice Edwin, much appreciated. 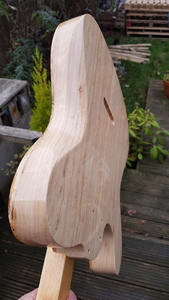 It’s a good job you mentioned about the spray sealer, I was going to give the whole body a couple of coats of nitro sealer. I think I’m just going to go for it with the 2k without putting any more sealer on it. The Tele I’m working on I actually sprayed once before with 2k but I stupidly chose the hottest day of the year to do it. I put the first coat on and it looked fine but then I came back 10 mins later to apply another coat and the lacquer was coming out of the gun like render, it was literally going off in the gun. I continued with the rendering and left it to cure over night. It wasn’t my finest hour. When I started to sand it down, I noticed there were tiny white speckles throughout the whole thing. It probably would have buffed up ok to a shine but it just had this overall misty/hazy look to it. I was so annoyed with myself, I just left it for a couple of months, wondering whether I should just throw it all in the bin and start a new project. I have come back to it now though and I will try again but I’m really nervous about it. If it doesn’t work this time, I will throw it in the bin! Well, it’s not gone that well really. The back and sides have come out really well but the front face has some major fisheye for some reason. 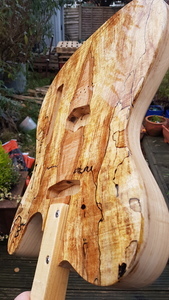 I think when it’s cured, I’ll mask off the sides and back and sand the front down and start again. A*se! You could also try shellac as a sealer. It's supposed to go with (almost) any kind of paint. Yeah, I think I need to stay away from sanding sealer. I wonder if it could be anything to do with the CA glue I used to stabilise the spalt. I’ve never used shellac, don’t know how to use it, I guess I’ll have to learn. 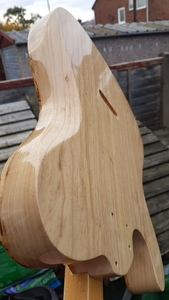 I could sand the lacquer down and use Danish oil and then Tru Oil. You can wipe shellac on with a rag, a couple of coats. Then level it with very fine wire wool or 1500 grit paper. Then spray over it with 2k. I will do that, thanks for your help Edwin. 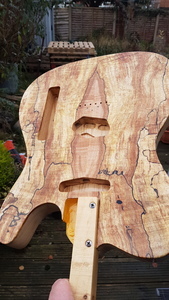 It’s hard to tell anything is wrong but here are some pics and a video of my Tele today. The majority of it is fine but the fisheye on the front looked terrible on the first coat but I have managed to bury it quite a bit with the second coat. The sides and back look great!